Heat oven to 350°F. Spray bottom and sides of 13x9-inch (3-quart) baking dish with cooking spray. In 4-quart saucepan, heat milk over medium-high heat until just boiling. Reduce heat to medium; stir in oats with spoon. Cook 1 minute, stirring occasionally. Remove from heat. Add butter; stir occasionally for 2 to 3 minutes or until butter has melted. Beat in cake mix, eggs, vanilla and salt with spoon until well blended. Stir in chocolate chips. Pour into pan. 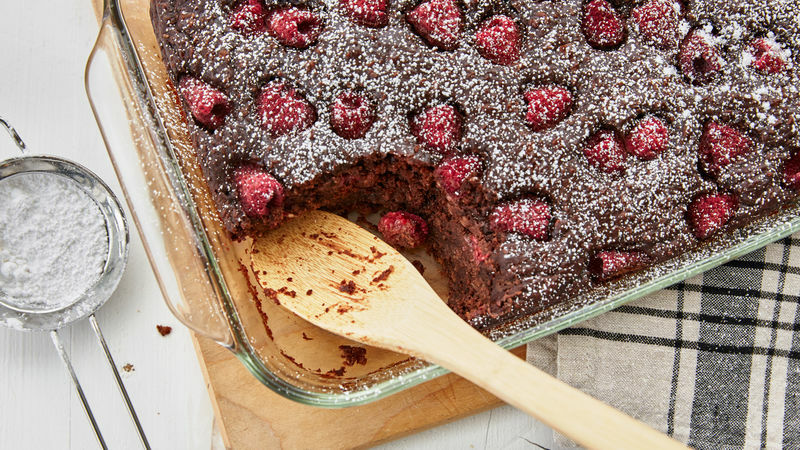 Sprinkle raspberries on top. Bake 38 to 43 minutes or until toothpick inserted in centre comes out clean. Cool 30 minutes before serving. When ready to serve, sprinkle lightly with icing sugar. Use large spoon for serving. To ensure success in this recipe, use quick-cooking oats for best results. For more chocolate flavour, try drizzling chocolate-flavour syrup over top of cake!